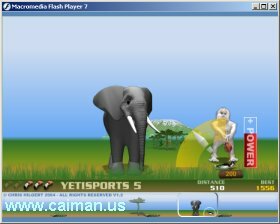 Caiman free games: YetiSports 5 - Flamingo Drive by Chris Hilgert. 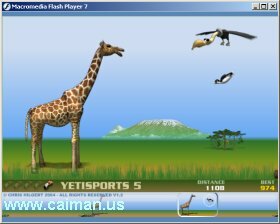 A real funny flash minigame. Set the angle and the power and the Yeti will throw the pengiun so far as possible. With the help of flamingos, Yeti undertakes a absolute funny and incredible amusing safari in the African savanna. Underneath giraffes, over elephants and acacias, catapulted high up to the sky by snakes and carried by vultures, the penguin demonstrates clean flying tricks on advanced level. Stel de hoek en de kracht in en de Yeti zal de pingiun zo ver mogelijk wegwerpen. Met de hulp van flamingo's, Yeti geniet van een absoluut leuke safari in de Afrikaanse savanne. De pingiun vliegt boven giraffen, olifanten en bomen, bots op slangen die hem weer de lucht in katapulteren, waar de pingiun wordt gedragen door een gier. YetiSports 1 - Pingu Th.